Three of those persons left the ballot blank or cast a write-in vote, meaning that the winner needed one more than half of 3,843, or the 1,922 votes, to win. The official count filed on Dec. 9 gave Horton one more vote than the preliminary results released at the end of the evening on Dec. 6, and he ended up with 2,182 votes, or 56.8 percent of the total. An analysis of turnout and votes at the precinct level shows that turnout played a deciding role in the Dec. 6 election outcome in several interrelated ways, some unique to this election and some consistent with elections in the past. Horton topped a list of three persons with 8,028 votes in the Nov. 8 special election. Horton, Ben Bridges and Marcus Wiedower were running as Republicans to fill the unexpired term of John Daniell, who stepped aside in March to seek, ultimately unopposed, the Board of Commissioner Chair position. Melvin Davis, who served as BOC Chair for 16 years, announced his retirement a year ago. That special election, held in conjunction with the general election, which included the presidential race, brought out 20,476 voters, representing 83.0 percent of the county’s registered electorate. But because Horton did not get a majority, he was forced into the runoff with second-vote getter Marcus Wiedower and ultimately ended up winning his seat not because 8,028 chose him but because 2,182 did. Because of the way Oconee County elections are resolved, the five commissioners who will represent the county come Jan. 1 will have won their deciding election with relatively small numbers of voters selecting them. The range is from the low of 2,180 votes received by William “Bubber” Wilkes in his runoff in 2014 to the high of 4,397 received by Mark Saxon in this year’s May primary, as Chart 1 below shows. Click any of the charts or the map to enlarge it. State law required the Dec. 6 runoff even though Wiedower and Ben Bridges, the other candidate, received only 24.1 percent and 30.4 percent of the vote respectively. Horton got 45.5 percent of the vote. Since none of the three contenders got one more than 50 percent of the vote, the runoff was required. Since both Horton and Wiedower had enough supporters to win a low-turnout runoff, because Bridges’ votes were up for grabs, and because voters could go to the polls on Dec. 6 even if they had not voted on Nov. 8, the runoff essentially was a completely new contest. Horton ended up with the 56.8 percent of the vote, compared with 43.2 percent for Wiedower. 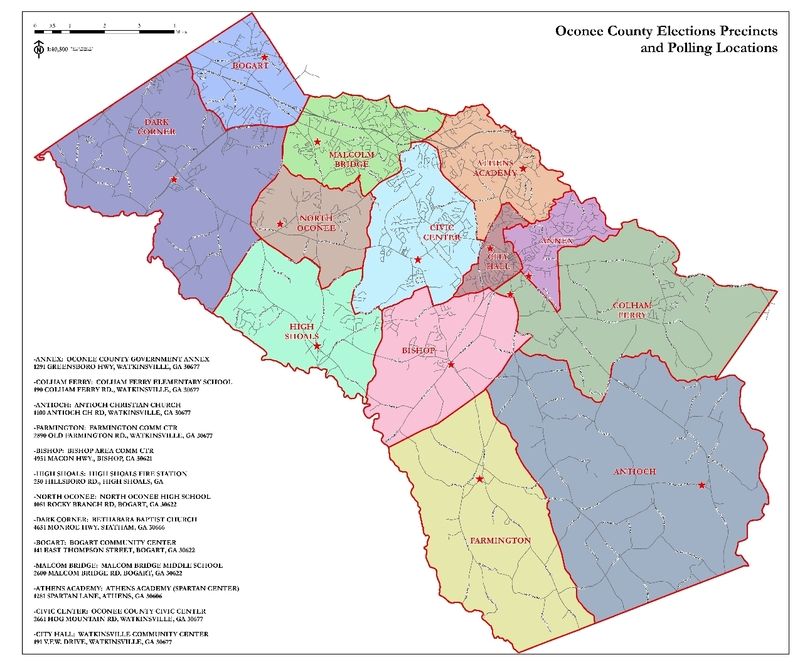 The chief reason that turnout is what determines the Board of Commissioner election outcomes as shown in Chart 1 is that the county’s races are partisan and the Oconee County Democratic Party does not put up candidates. That means that decisions are generally made in the Republican Primary or Republican Primary Runoff rather than in the General Election in November when turnout is higher. In those general elections, without opposition, the candidates do get larger number of voters. Daniell and Wilkes ran unopposed in the November 2014 election and Daniell, Saxon and Thomas ran unopposed on Nov. 8 of this year. Daniell got 16,706 votes on Nov. 8 in his race for the BOC Chair position, but the 20,476 Oconee County voters who cast a ballot had to vote for Daniell for that slot, leave the slot open, or cast a write-in vote. Write-in votes are not tallied, unless the campaign is organized and the write-in candidate files paperwork with the Board of Elections and Registration, so essentially the write-in is the equivalent of leaving the ballot blank. Mark Thomas got 16,793 votes in his uncontested race for Post 1 on Nov. 8, and Mark Saxon got 16,746 votes in his uncontested race for reelection to Post 4. Daniell got 11,033 votes in the November 2014 election when he ran unopposed for Post 2, and Wilkes got 10,998 votes when he ran unopposed in that election for Post 3. The simple explanation for why Horton beat Wiedower in the Dec. 6 runoff election is that Horton won seven of the county’s 13 precincts, including all but one of the seven precincts with 1,800 or more registered voters, as shown in Chart 2. The bars represent the size of the precincts. The six large precincts that Horton won also are the most urbanized. But that simple explanation misses the fact that two of those precincts played an outsized role in Horton’s victory, both because of their high turnout and because of their strong support for Horton. Of the 2,182 votes that Horton received in the Dec. 6 contest, he got 624 of them from Athens Academy and Annex precincts, or 28.5 percent of his vote total. That 624 actually represents 32.5 percent of the 1,922 Horton needed to win. Athens Academy includes subdivisions east of Daniells Bridge Road, among them the one in which I live, Welbrook Farms. Annex includes the eastern side of Watkinsville and subdivisions on both sides of Simonton Bridge Road. Athens Academy and Annex abut, and both would be affected by the proposed sewer pipeline down Calls Creek and the proposed flyover of Daniells Bridge Road to connect to the Oconee Connector at Home Depot. Horton took strong stands in opposition to both, while Wiedower’s stances were more nuanced. Horton, 62, lives at 1061 Ramblewood Place in Hickory Hill subdivision in Annex precinct. Wiedower, 41, lives at 1081 Princeton Lane in City Hall precinct. While turnout overall was low in the Dec. 6 runoff (15.6 percent), it varied quite a bit by precinct, as it had on Nov. 8. I have recalculated the Nov. 8 turnout rates to include the number of inactive voters who actually cast a ballot on Nov. 8. That recalculation reduced overall turnout rate from 85.0 percent as reflected in the unofficial returns for Nov. 8 to 83.0 percent. Only 71.5 percent of the voters actually cast a ballot on Nov. 8 in the special BOC Post 2 election, as shown in the chart. Chart 3 also shows the gap in turnout on Dec. 6 vs. Nov. 8, with the overall gap for the county of 55.9 percent. That gap was particularly small in three precincts: Athens Academy, Annex and City Hall. Horton won all three of those precincts. Athens Academy and Annex make up 18.0 percent of the registered voters in the county, but they turned out 21.6 percent of the vote in the Dec. 6 runoff. As shown in Chart 1, Horton won seven precincts on Dec. 6, but he actually had received a majority–not just a plurality–of votes in Athens Academy and Annex on Nov. 8. Chart 4 shows Horton’s percentage of votes in each of the county’s 13 precincts on Dec. 6 and the percentage of votes received by Bridges and Wiedower on Nov. 8. I dropped Wiedower’s vote on Dec. 6 from the chart since it is simply the opposite of that for Horton. Chart 4 shows that Horton’s percent of the vote in Athens academy was 20.4 percentage points higher on Dec. 6 than it was on Nov. 8, and his percent of the vote in Annex was 20.5 percentage points higher on Dec. 6 than on Nov. 8. Horton’s percent of the vote in each of the other five precincts he carried on Dec. 6 also was higher on Dec. 6 than Nov. 8, as was necessary for him to get a majority and thus win the precinct, ranging from a gain of 9.0 percentage points in Colham Ferry to 14.0 percentage points in Malcom Bridge. Colham Ferry abuts Annex and is affected by the uncertainty created by the Calls Creek sewer line, but it’s southern parts are quite rural in nature. Horton won the plurality of votes on Nov. 8 in every precinct except High Shoals, which Wiedower carried. In Bishop, Horton got only 1 more vote than did Wiedower, but the gap in the other 11 precincts was pronounced. Horton did little to improve his vote percentages on Dec. 6, however, over what he had received on Nov. 8 in the six precincts he did not carry on Dec. 6. As Chart 4 shows, Horton picked up little additional support on a percentage basis in Antioch, Farmington, Bishop and Dark Corner. Horton even saw a decline in the percent of support in North Oconee and High Shoals. Of those who cast a ballot in the special election runoff on Dec. 6, 42.1 percent voted through advanced in-person voting, 4.9 percent voted by mail, and 53.0 percent voted on election day itself. Horton did much better in advance voting, getting 64.4 percent of the vote, versus only 50.6 percent on election day. Horton got 57.8 percent of the mail vote. Horton carried all but three of the 13 precincts in advance in-person voting, but only five of the 13 precincts in voting on election day. Chart 5 shows the percent of the vote that Horton got overall by precinct, and the percentage of voters from each of the precincts who cast a ballot on election day (regardless of for whom they voted). Athens Academy had the lowest relative number of voters waiting until election day to vote and gave Horton his highest vote percentage. Annex also had low election day voting relative to advance voting and gave Horton his second highest vote. Election day was cold and wet, making it more likely that people whose work is adversely affected by weather would go to the polls. This includes farmers and people who work in construction, both of whom are much more likely to live in the south of the county and not in the county’s more upscale neighborhoods. The data show that Wiedower, who is a custom home builder and who received support from prominent figures in the development industry in the country, did better on the cold and rainy election day. That gap was more pronounced in the southern, less urbanized parts of the county than in the northern, more developed parts. Farmington, the smallest and least urbanized precinct, cast 80.0 percent of its votes on election day and went for Wiedower. Dark Corner, which is large in terms of land mass and number of voters, is transitioning from rural to developed. It had high election day turnout relative to advance-in person voting and went strongly for Wiedower. Precinct analysis of the sort shown here is meaningful only if there are characteristics of the precincts other than their vote that make them distinct and if the precincts are relatively homogeneous on those characteristics. As noted, Dark Corner is harder to classify in terms of the rural and urban divide than a precinct such as Farmington or Antioch. 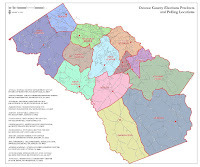 Election analysis also can be misleading in terms of understanding a county’s citizens if registration rates are low, but that is not the case in Oconee County. It isn’t possible to get a precise figure on the rate of registration in the county, but the evidence is that it is very high. The U.S. Bureau of the Census’ latest population projection for Oconee County is for 2015. That figure, based on the 2010 Census count of 32,815, is 35,965. Of those, 25,065 are projected to be 18 years old or older, meaning they are likely to be eligible to register to vote. The number of registered voters in Oconee County for the Dec. 6 election was 24,657. That suggests that registration rate is in the neighborhood of 98 percent. "The Oconee Democratic Party does not put up candidates." or as a practical matter, thinking the numbers don't work? A Democrat did win a seat in Watkinsville City. In my never humble opinion, a reasonable and rational Democrat would grab a good deal of attention. Good alternatives create good discussions. Hint: A moderate. A Bernie or Hillary type won't fly. "The range is from the low of 2,180 votes received by William “Bubber” Wilkes in his runoff in 2014"
Sad, sad, sad to think that Bubber Wilkes is a commissioner with less than 220 votes. We need engaged, transparent, aware, decisive and thoughtful county commissioners. Leaders who have traveled around the state and country and are actively seeking out "best practices". Leaders who don't play favorites with selected developers and "Old Oconee" families. Leaders who leverage ur location next to UGA instead of approving more and more fast food shacks and self storage lots. We can do better y'al! Waiting for John Daniell to go on the record on his stances on Calls Creek sewer, the $20 million flyover bridge, the 441 re-routing, the leftover unspent SPLOST funds from years ago, courthouse changes/new county admin building, etc., etc. Lots of important short-term/long-term county issues to be addressed; have heard little from Daniell on most of them. Hoping & praying for fresh viewpoints from him, with very open and transparent communication from the Board of Commissions to county residents. The days of behind closed door county dealings need to end now (Davis negotiating with UGA on Government Station Rd., his dealings with Frank Bishop, Jamie Boswell & GDOT, the Doug Dickens allegedly promised entry/exit debacle, etc., etc., etc. ).